Figures released by the Welsh Government showed Welsh councils recycled or reused 53% of their waste between April and June this year – and in the 12 months to June increased by 2% to top 50%. Environment Minister, John Griffiths, announced the results at the Waungron recycling centre in Cardiff and credited much of the increase to every council in Wales recycling food waste. But statistics varied significantly between council areas – with Rhondda Cynon Taf recording an alarming 8% fall between April and June compared to the same period last year, to record the lowest recycling rate in Wales at 44%, with Neath Port Talbot Council on 45%. Denbighshire and Caerphilly saw the highest rates at 61% and 60% respectively. 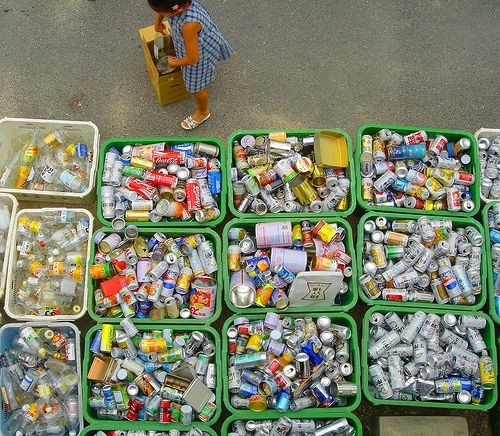 Denbighshire said its position was down to its simplified recycling system of dividing recycling types into one bin – a policy which was previously opposed by the Welsh Government. The council has clashed with the Welsh Government in the past over its policy, with the government preferring a method of separating different types of recycling before collection. Mr Griffiths hailed the figures as a “very significant milestone” for the policy. The Welsh Government has a statutory target to recycle 52% of its waste by next year, 70% by 2025 and to have zero waste by 2050. “Moving on beyond 50% right across Wales as a Wales average is very heartening for us,” he said. “Of course next year is the first statutory household waste recycling target of 52% – and there were many that thought that local authorities in Wales wouldn’t be in a position to meet that target. “But happily I think we’re in a very positive and promising position.” But Mr Griffiths conceded there was “patchiness” between local councils and warned that councils – already struggling with squeezed budgets – could face fines if they fail to reach 52%, admitting the huge variation was “unacceptable”. He said that officials were already in discussions with councils with “considerable” falls in recycling rates to understand particular local circumstances. He ruled out a more centralised policy, saying that it was up to local authorities to decide how they would meet the targets. But he said there was a danger that UK Government policy was “not helpful”, in the wake of news that Eric Pickles was putting pressure on local authorities to reinstate weekly black bin collections. He said: “I suppose if you looked at it in terms of the overall effort in terms of deal with climate change to drive forward progressive environmental policy, I would certainly say that’s what happening in England at the moment is counter productive on that front. “I think we’re showing a much better example in Wales. I think we’ve got the evidence to back that up. 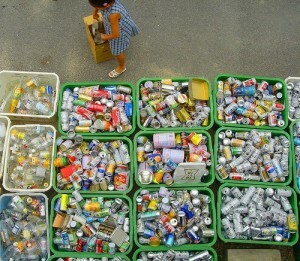 A spokeswoman for Denbighshire Council said its record on recycling was down to its simplified system. She said: “As a consequence, more people participate in the scheme, and the people who do participate are far more likely to recycle everything they can. “Denbighshire’s view is that if you make your system complicated, a significant proportion of people are ‘turned-off’ and won’t do it. “Simplicity is a virtue as far as we are concerned. All of our plastic, paper, cans and bottles goes into one bin. Some councils have four separate containers for these materials.” Louise Tambini, from Keep Wales Tidy, welcomed the news that Wales had already exceeded its target for next year. “Keep Wales Tidy is delighted to see that, on average, the councils are already meeting the targets they were set across Wales as a whole, which is a result of their considerable efforts,” she said.